The health service in Northern Ireland has dished out almost £7million worth of gluten-free products free on prescription, it can be revealed. The products, which include loaves, pizza crusts, rolls, flour and bread and cake mixes, are available on prescription under the Northern Ireland Drug Tariff. In total, £6,991,825 was spent on the foodstuffs from 2013 to 2017. A spokesman for the Health and Social Care Board (HSCB) said that the products are prescribed for patients who are "diagnosed with gluten-sensitive enteropathy with coexisting established wheat sensitivity." She added: "The Advisory Committee on Borderline Substances (ACBS) recommends products for inclusion on the basis that they may be regarded as drugs for the treatment of specified condition." UUP MLA Roy Beggs has called for a public consultation on the provision of gluten-free products on prescription, arguing that the products have become much more widely available in recent years. Last year, primary care providers here spent £1,268,484 on prescribing gluten-free bread products, down from £1,554,604 in 2013. Several gluten-free products have been available on prescription to people with a confirmed diagnosis of gluten-sensitive conditions such as coeliac disease in Northern Ireland since the late 1960s. This is similar to all other parts of the NHS in the UK. However, all the products are also available to purchase online from supermarkets and chemists. 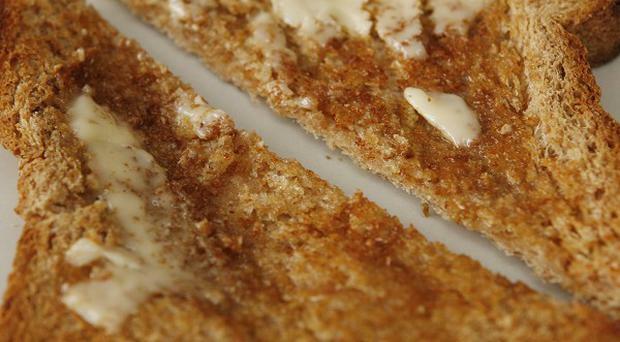 The greatest spend on a single item last year was on Juvela gluten-free loaf sliced, which cost the health service £168,072. A 400g loaf costs the NHS £3.54, but is available to buy in supermarkets for just £2.80. Similarly, a packet of Barkat gluten-free bread mix (500g) can be purchased for £4.89 online - but costs the health service £6.94 per packet. Another product, Barkat gluten-free home fresh country loaf (250g), is available to buy for £2.79 online. However, it costs the NHS £4.43 to prescribe per pack, an extra £1.64. An HSCB spokesperson defended the costs: "The aim of prescribing these items free of charge on prescription is not to provide free medicines to people who would otherwise pay for their medication. "However, it is well documented that adherence to a gluten-free diet is essential for patients with confirmed gluten-sensitive enteropathies, for example coeliac disease, in the prevention of long-term complications such as osteoporosis or other conditions." Charity Coeliac UK defended the prescription of gluten-free products on the NHS. A spokesman stated: "The treatment for coeliac disease is the gluten-free diet. And the necessary removal of food containing gluten, for example bread and other staple foods from the diet, requires significant adaptation given the key role of the foods in the diet. "Replacement of core staples such as breads and flours by gluten-free equivalents enables better adherence to a gluten-free diet. This in turn avoids ill health and expensive treatment of complications. "Access to gluten-free core staples on prescription also helps address the risk of inequality due to the higher pricing and limited availability in retail affecting those people who use budget and convenience stores." The spokesman added that the amount spent on gluten-free prescriptions in Northern Ireland is "in line with the spend of other parts of the UK in view of the number of people diagnosed with coeliac disease in Northern Ireland". But Mr Beggs added: "At this moment in time the Northern Ireland health service is in the midst of its worst-ever waiting times crisis, so difficult decisions will need to be taken in order to ensure that the NHS is best spending the resources it is being given every year. "A major public consultation was carried out by the UK Government last year and the majority of responses were in favour of the NHS in England restricting gluten-free prescribing to certain products such as bread and mixes. The UUP would be broadly supportive of moving to a similar scheme in Northern Ireland."